As Dr. Paul Branson struggles through the difficulties of his captivity and the loss of his wife to cancer, he is surprised when a woman he is forced to trust captures his attention. Hanna is a young woman with long, brown hair that has reddish highlights in the sun. A captive herself, she has been in a position of trust for years as the medical person for the LRA. Although Quinn abducted her only a semester before graduating from medical school in Uganda, she has the skills he needs to care for his injured men. Because she is so valuable to Quinn medically, she is spared the atrocities reserved for the women kidnapped by the LRA. Paul felt Miju tying his right hand back to the bed frame. He recognized Hanna’s soft voice. Hanna notices Paul as well, but he is carefully guarded to prevent his escape and force his cooperation. As their paths become intertwined in this twisted world of terrorism and intrigue, they are drawn closer and closer to each other. Although Paul must leave her behind, will they be reunited? 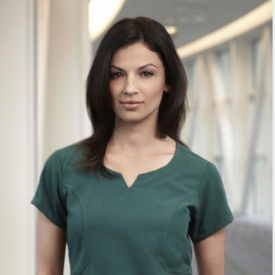 Floriana Lima is the extremely talented actress who reminds me of Hanna.